Description: The Vamanamurthy Temple at Trikakkara is an ancient one, located 14 km north east of Irinjalakuda on the Thrissur Ernakulam railroad. It has been glorified by the tamil hymns (Tiruvaimozhi) of Nammalwar, of the 1st millennium CE. This temple is associated with the Onam festival; Tiruvonam is celebrated in the Malayalam month of Chingam (Leo), the last day Onam marking the avataram of Vamana and the banishment of Mahabali Chakravarti to the netherworld. Onam is the most important festival celebrated in Kerala. Even today, an image of Trikkakkara Vamana is symbolically used in Onam celebrations in several places in Kerala. This temple celebrates the legend of the origin of Vamana - Trivikrama and his conquest of the worlds with his massive Trivikrama form and his placing his foot on Mahabali Chakravarti's head. Local legends even associate the Kapila theertham with the source of water with which Mahabali Chakravarti symbolically made his offering of land to Vamana. Legend has it that Mahabali returns to the earth once a year during the Onam festival and that his return is marked by celebrations involving floral decorations and more. An extension to this legend has it that a yogi was accused unjustly of stealing these golden plantains; acquitted later after undue punishment, the yogi cursed the place to befall into ruins. The legend states that the yogi, thanks to his untimeley death caused by the undue punishment and humiliation turned into a bhramharakshasan and that a shrine was built to propitate his spirit. The region went through wars and conquests and suffered poverty, apparently due to the yogi's curse. It was only later that the administration of the temple was taken over by the Travancore kingdom and the temple began to see better times. Deities: The presiding deity here is Vamanamurthy. There are subshrines to Sastha and Mahalakshmi. 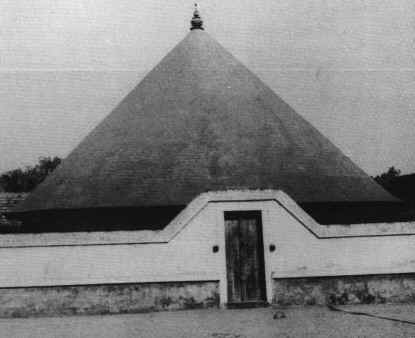 This temple is characterized by its vritta (circular) vimanam. A Shivalingam in the temple is said to have been held in worship by Mahabali Chakravarti. There are inscriptions here from as early as the 10th century CE the period of Bhaskara Ravivarma. This temple is said to have received endowments from the Chera king Kulasekhara Perumaal of the 9th century CE.